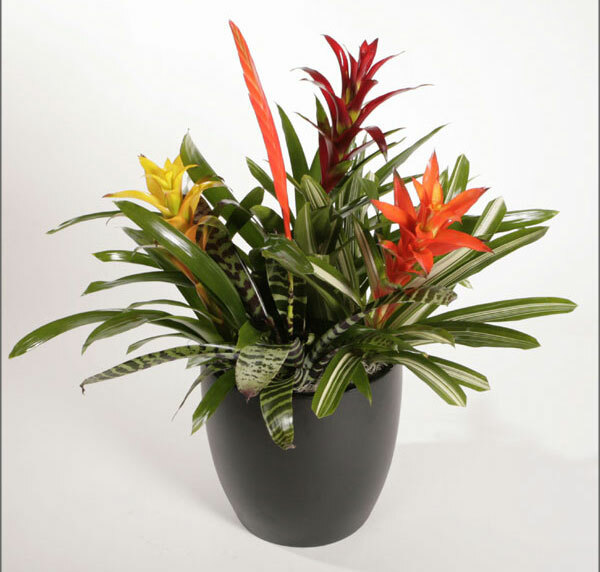 Most commonly used varieties: Aechmea, Gusmania, Neoregelia, Tillandsia and Vriesea. Drought-hardy plants, needing water only when the soil is dry. Bright, colorful tabletop display plant. Depending on the species, Bromeliad foliage can be broad and sword-like or thin and grass-like, smooth or spined. Bright, colorful tabletop display plant. Bromeliads vary in appearance. Depending on the species, Bromeliad foliage can be broad and sword-like, thin and grass-like, or smooth. The foliage color usually ranges from silvery gray to deep green, sometimes accented by a variegated or striped pattern. The inflorescence is made up of leaf-like bracts surrounding the flower. Once blossomed, it will slowly die over a period of one to two years. In that time, it will produce three to four baby plants growing from the base of the mother plant, called “pups.” Most Bromeliads are composed of a rosette of leaves (“cup”) at the center, where colorful blossoms emerge. In nature, this cup forms a kind of funnel that fills with rainwater, dead leaves and decaying animal matter. The leaves have a thick cuticle and their bases are covered with scaly hairs that enable the water to be absorbed. Bromeliads do best in bright, indirect light. Soft, drooping leaves with faded color are a sign of too little light. On the other hand, yellow or bleached leaves usually indicate too much light. Direct sun will burn the foliage. They do best in temperatures from 55 to 85 degrees Fahrenheit. Because interiorscapes usually rotate Bromeliads every two to three months as the bloom fades, fertilization is unnecessary. Bromeliads are drought-hardy plants, needing water only when the soil is dry. In particular, it is especially important in low light to let the soil dry out between waterings. If left in standing in water, they will rot. In most interiorscapes, except those with great light, don’t water into the cup—this will also cause them to rot! Bromeliads are members of the “Pineapple Family” (Bromeliaceae Family), which include more than 200 species and thousands of hybrids. Bromeliads can be found growing in extremely diverse environments: deserts, rainforests, mountains and beaches. Yellow or bleached-out leaves can indicate too much light. Trim off brown, damaged or faded foliage. Since the plant is usually in the account for a short rotation, fertilization is not necessary. Although, if you do have a brome that is a permanent planting in your account, fertilize it four times per year with a balanced mix. Bromeliads are hard to clean with a duster. The duster can knock the top off or get caught on the thorns. But they do need cleaning during their stay indoors. However, an easy solution is a quick spray of the foliage on a weekly basis with a mild solution of soap and water. Watch for an occasional infestation of scale, mealy or mites.